A dazzling new structure took up residence in the Bearpit. Part-sculpture and part-shelter, Philip Cheater’s design was inspired by old pavilions and bandstands, as well as the Bearpit’s previous hexagonal landscaping. Decorated with hazard-graphics, Pavilion juxtaposed the visual language of warning with a warm invitation to gather, to meet and to celebrate – reflecting changing attitudes towards the Bearpit itself. Pavilion was created by Philip Cheater in collaboration with Eifion Porter. Groups and individuals are invited to hold their events in Pavilion for free. 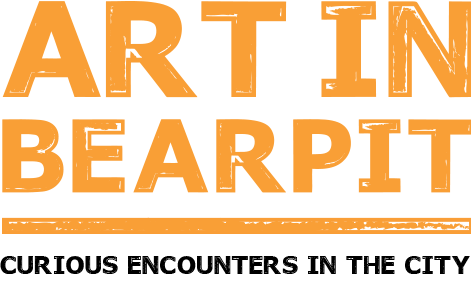 Get in touch on email@artinbearpit.com for more info. Philip Cheater creates drawings, sculptures and installations using patterns and graphic elements found within the everyday urban environment. Referencing the visual language of institutional Health & Safety culture, Philip satirises key elements by reproducing them on a monumental scale in unfamiliar landscapes, altering our perception of the world we live in. Philip is an artist based in Swansea. Recent commissions and exhibitions include Locws International, Cardiff Contemporary, Oriel Davies and Elysium Gallery.